QUEBEC – Vancouver-based Goldcorp is investing $3.7 million to acquire a 14% interest in the new Quebec Precious Metals Corp. 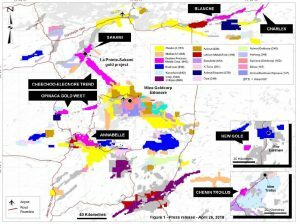 The new company will combine the assets of Montreal-based Canada Strategic Metals, Matamec Exploration, and Sphinx Resources. Together the three juniors control about 942 sq. km in the Eeyou Istchee James Bay region. The focus of the new company will, naturally, be for precious metals in that area. As part of the deal, Canada Strategic Metals will acquire Sphinx’s three gold projects. Then that company and Matamec will be merged to create Quebec Precious Metals. Goldcorp has agreed to purchase approximately 6 million subscription receipts at a price of $0.61 each. Upon completion of all arrangements, the receipts will be automatically converted into shares representing 14% of the new company. The Quebec Precious executive team will include John W.W. Hick as chair of the new board of directors; François Biron, as Vice-Chair of the board; and Jean-Francois Meilleur as president, Normand Champigny as CEO, Jean-Sebastien Lavallee, Jean-Raymond Lavallee and Michel Gauthier as directors. A website for Quebec Precious Metals has yet to be established.